Photo courtesy of Serengeti Balloon Safaris. When Louis the XVI commissioned the first untethered hot air balloon ride in Paris, France, in 1783, his aim was to realize the birth of an extraordinary means to showcase his glory, if not catapult France to the forefront of the scientific revolution. Now more than 200 years later, hot air balloon flight remains a time-honored reality, regardless of the fact that there are much faster ways to get from point a to point b. Therein, actually, lies the allure: there is quite possibly no more breathtaking a way to experience a locale than serenely suspended above it in a hot air balloon. Searching the globe for the finest in first-class balloon excursions, we narrowed the list to a handful of the most exclusive guided tours, and one with the top training facility in the business should you decide to become a pilot yourself. We guarantee that the view from up here is something incredible to behold. Buddy Bombard’s Europe offers “Five-Star Journeys for the Refined Traveler” and definitely delivers in this regard. All trips are hosted by founder Buddy Bombard himself, a Renaissance man in the truest sense of the word. Bombard has personally traversed the globe as an air force jet pilot, skier, scuba instructor, America’s Cup Yachtsman, insurance executive, tour and travel entrepreneur, photographer, balloon pilot, gourmet and all-around raconteur, and brings his undimmed joie de vivre to each and every excursion as its personal host. With one-third of each day devoted to ballooning, his well-informed staff ensures that every other aspect of the trip matches the splendor of seeing some of the world’s most beautiful landscapes from above. You will stay at deluxe hotels, dine at exceptional restaurants and enjoy ground excursions led by the most knowledgeable guides. While the FAA only requires that one log 35 hours of balloon experience before receiving certification, each of Bombard’s staff pilots has more than 5,000 hours! A world of medieval castles and world famous vineyards awaits you in Burgundy, France’s wine country. Guests of this trip will be escorted from Paris to the deluxe Hôtel le Cep in Beaune for five days and four nights, with four afternoon balloon trips planned over the course of four days (one trip each afternoon). You will visit wine cellars that have served this region for centuries, including the 12th century monastic winery of Confrérie des Chevalier du Tastevin. When you are not soaring over them you will also have the opportunity to drive through such vineyards as Montrachet, Meursault, Pommard and Romanée-Conti, with elegant lunches scheduled at fine restaurants throughout the region. You will also enjoy a private luncheon with the Countess de Loisy at her wine estate. Other highlights include a guided visit of the 14th century Château de la Rochepot and its village, a veritable fairytale environ if ever there was one. In the evenings, you will experience candlelight dinners at the 14th century Château Savigny Les Beaune, and an excursion on Day Four to Hospice de Beaune, one of Burgundy’s most important landmarks as a former charity hospital that now hosts Burgundy’s most important wine auctions. Your last night will include dinner at Bombard’s own home in France, the flower-filled Orangerie of Château La Boide. Trip combos to the Loire Valley, Switzerland, Florence and Siena are also available. Those with a passion for the exotic and surreal will relish the next excursion, which offers ten days and nine nights of exploring what was once the seat of one of Europe’s mightiest empires. Your journey will begin with three nights in Istanbul at the Five-Star Ciragan Palace Hotel, which was formerly the palace of the region’s mighty sultans. Your guided ventures through Istanbul will include trips to such historic landmarks as the Topkapi Palace, the Grand Bazaar, St. Sophia’s, the stunning Blue Mosque and Dolmache Palace. Dolmache was the last home of the Ottoman Sultans, and at 600 yards long it dazzles with its extensive gold interiors and authentic harem. You will then be entranced by a sensually romantic evening at the Karavansarai Supper Club, where the folkloric entertainment includes a classic belly-dancing show. The pièce de résistance of this trip is arguably the five scheduled morning balloon trips through Cappadocia, where you will drift over and among ancient rock formations and valleys that bear witness to both Mother Nature’s might and humankind’s ingenuity. Here, 60 million years of erosion has transformed compacted volcanic ash into rock formations that are otherworldly. You will enjoy elaborate catered luncheons among the rock formations, as well as nightly private dinners in such locations as the 10th century cave church of Avnali where a dance performance by a troupe of Whirling Dervishes will lend their legendary passion and grace to your dining experience. Trip combos to Salzburg, Austria and Florence and Siena are also available with transfer. For more information visit www.buddybombard.com, or call 800-862-8537. If you are yearning for the adventure of a lifetime, the world’s second-largest continent awaits you. Africa’s Serengeti region is nothing less than a visual poem proclaiming nature’s vastness and splendor, its sights and sounds providing us with a glimpse of the planet’s primeval beginnings. Balloons fly daily at dawn, and guests are treated to a lavish “Out of Africa” inspired breakfast that includes mouth-watering tropical fruits, warm, freshly-baked bread and a traditional English breakfast served on bone china by stewards in Swahili dress. Guests are collected at 5 a.m. from their central Serengeti lodge or camp and transferred by Land Rover to a launch site near Maasai Kopjes. Floating in the direction of the wind, you will fly both higher and lower than the treetops as you take in not only the Serengeti plane, but possible sightings of lion prides, pods of hippopotamuses and the annual million-strong wildebeest migration, depending on the time of year. Flights last for one hour, and end with a traditional champagne toast upon landing. Serengeti Balloon Safaris (SBS) pays a substantial royalty to Tanzania National Parks for each passenger, and funds are applied to various conservation efforts in the region. 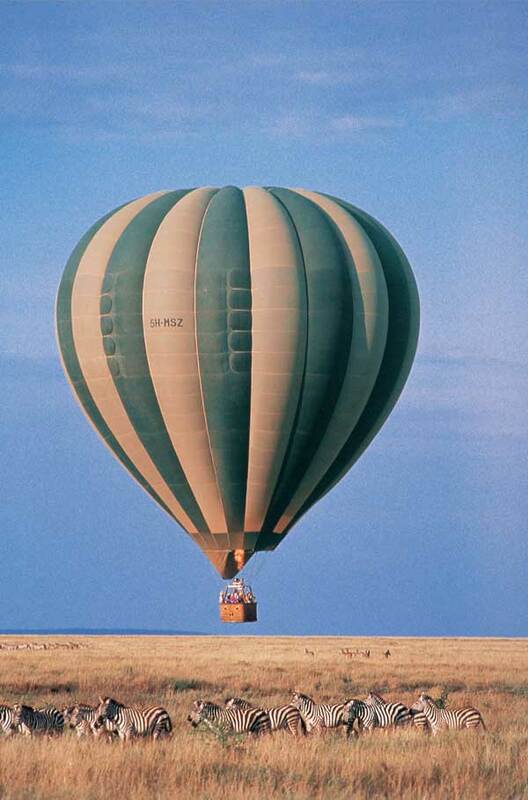 Balloons are subtly colored in shades of “acacia green” and “savannah gold” to better blend with the environment, while the company’s “stealth” and “whisper” balloon burners make less noise than standard hot air balloon burners. This results in guests having a chance to hear the sounds of nature below, which only elevates the experience of floating over this region. Whenever possible, SBS lands their balloons on a road to save the local vegetation from damage by retrieval vehicles. SBS’s pilots are themselves committed conservationists who enjoy sharing their knowledge with guests, and SBS’s Director, Colin MacKinnon, was even deemed an elder by the local Wakoma tribe. SBS has assisted in the fundraising and construction of a school in the Rubanda Village, with the objective of teaching income-generating skills to villagers as an alternative to wildlife poaching. SBS has also sponsored educational trips to the Serengeti National Park for local village school children, striving always to build bridges between humankind and the natural world through education. Even tourists who are visiting the area on an organized safari with a set itinerary can take part in an SBS balloon excursion, provided they are staying at any of the central Serengeti lodges or Western Corridor luxury camps. SBS will collect such travelers from their lodge or camp before each flight and will return them by 9:30 a.m. to re-join their party. For more information, contact balloons-reservations@habari.co.tz or visit www.balloonsafaris.com. If at this point you find yourself fantasizing about piloting your own hot air balloon, we don’t blame you. It’s only natural that one would at least contemplate it after envisioning the freedom of this type of flight, and if you are seriously considering it, we have good news for you. Balloon the Rockies, located on the world-class Rocky Mountain Destination Resort in Park City, Utah, offers students the advantages of good weather and varied mountain terrain for quick skill development over the course of the company’s accelerated program. Chief Instructor Mike Bauwen has 32 years of ballooning experience throughout the world, and provides a curriculum that exceeds FAA mandates for certification. Bauwen even placed first in the 2000 Albuquerque Balloon Fiesta, the ballooning industry’s premier annual competition. 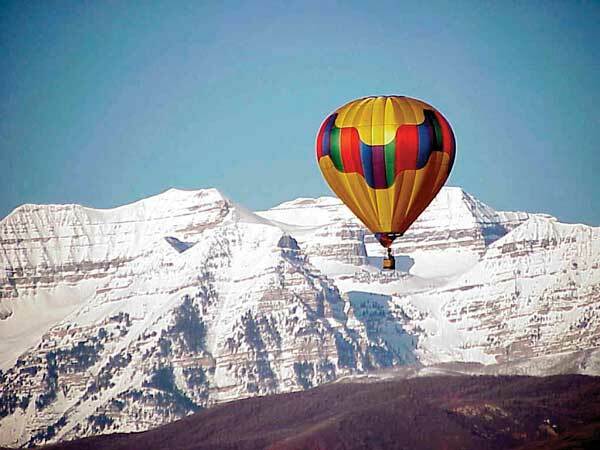 Students who enroll with Balloon the Rockies can usually earn an FAA Hot Air Balloon Certificate within two weeks of the first day of training, while Private Certificate training can be completed in as few as eight days. The company does not provide “crash courses” (no pun intended), but rather adheres to the FAA’s approved “141 School” teaching method that stresses daily attention to the fundamentals of flight with an emphasis on building critical-thinking skills that will enable a pilot to respond to a variety of conditions and circumstances. Balloon the Rockies can train pilots in specialties as well, such as professional ride operations, racing, mountain flying or just safe-quality sport flying. Students train in small, high-performance double-burner Aerostar Balloons, and after graduation they will be equipped to fly any brand of hot air balloon on the market today. The company also operates a full-service balloon repair facility on-site, and provides students with hands-on experience in understanding the basics of balloon maintenance. Training courses in balloon maintenance are also offered for those interested in entering the balloon maintenance and repair profession. For more information, visit www.aeronaut.com.